We’d love your help. 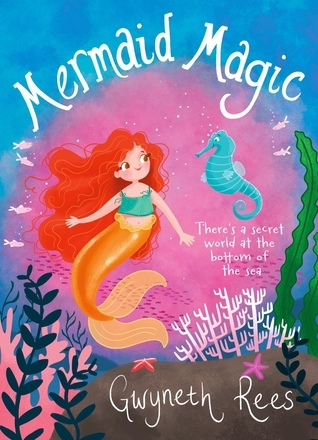 Let us know what’s wrong with this preview of Mermaid Magic by Gwyneth Rees. To ask other readers questions about Mermaid Magic, please sign up. This is one of those super cute children’s reads which will keep the young reader entertained for quite some time. It’s an engaging read, with a pace that leaves the child interested from the very first page until the ending where they will want to jump even further into stories written by Gwyneth Rees (of which there are some other good reads to pick between). I chose this book because it sounds interesting. So far I am in chapter four page 40 . I like the way it is reating it is a good book. This story was very interesting I read the whole thing in one sitting. I do feel it could of been written slightly better but can't wait to read some more from this book series. I read this series when I was about 7 or so. I really enjoyed them at the time! These books bring back so many memories of my younger childhood! I remember I went on holidays during the school holidays to a beach, and I remember lying in bed, and reading these books. They were some of my favourites! Read this at about the age of 8 years old ( in the middle of a mad mermaid faze) and fell in absolute love. Love. Love. Love. That is all I can say about this book. It was utterly magical and it really did make my childhood special.Isn't it amazing how stories can play such a big part in your life? Wow. Thankyou so much Gwyneth Rees. This book was literally my childhood. Since being really little and watching The Little Mermaid on VCR and having it on repeat I've loved mermaids. And I loved these mermaid books. The whole Rani Series was literally my life when I was younger. Just looking at this is so nostalgic, I love it. I read this book a few years ago and it still remains one of my favourite books. I listened to it on audio and was upset when i reached the end. I felt like i was in the book because it was so well described. Oh wow i remember reading this when I was around 10-12 and I really liked it. I can't remember much now except this scene where there were two blond mermaids that could hear each others thoughts or something. Just remembered that I read this book once years ago when I was like nine. I luv the cover.And Everytime I read it again and again.... I find something I didn't see/notice before. An enjoyable read! But I preferred her other fairy books a lot more! Gwyneth Rees writes the most magical stories, but I have to say, compared to the others, this was slightly lacking. I remember I read this at school and I was amazed how good it is! It was my first book i read by Gwyneth Rees and I recommend it!!! it said Rani's sea spell.